Professional development conferences, like International Society for Technology in Education (ISTE) coming up next week, offer opportunities for educators to get together and grow their craft. Prompt: Write a post about conferences and professional learning. Write a list of the top conferences you want to attend before you retire. Have you presented at an academic conference? If so, write about your presentation and share with everyone! Write about the most inspiring speaker you’ve seen at a conference, and tell about how it impacted your approach to education. Write a post discussing tips for getting the most out of conferences. Write a post about what conferences need to do to continue to be a positive force in education. Busy summer for me. See my post on Professional Learning. 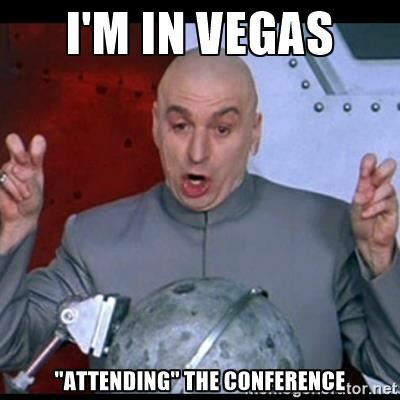 I am so behind in this endeavour, I don’t think I’ll ever catch up – however, while this message isn’t to link to my latest post – I haven’t written it yet – I really laughed out loud at the meme – because my husband did literally go the Vegas on a conference just a couple of weeks ago!!! Happy blogging everyone! This was a timely prompt & I am at the point in my summer when I am excited about where I am with all of this Professional Learning! Please check out what PL I am into and share some of your best stuff with me too!